The original recipe had been created by my cousin Ann Marie Somer and calls for the use of canned cream of Potato and Chicken soups (with milk). We decided to use methods that are more homemade. I’ve tried to follow the method as closely as I can but have omitted the canned prepared soups and milk, we do use sour cream and butter. Ann Marie and I were very close, we treated each other like brother and sister. A few years ago she had succumbed to cancer, we miss her dearly and think of her all the time. Our Pasta Alla Anna Maria recipe was also created as a tribute to her. Ann Marie was one of the strongest women that I have ever known and she was also a great influence (the women in our family are extremely strong willed). I miss her greatly as does anyone who knew her, we love you Ann Marie. 1. Prep the cut up chicken by dredging in flour, salt. 3. When the onions begin to turn translucent, add the pre-spiced and floured chicken pieces. 4. When the chicken is cooked on all sides, add the chopped celery. 5. As the celery begins to cook and break down, add the 2 tbsp butter. 6. Once the butter melts you can add the diced red and green bell peppers, let cook for 5-10 minutes. 7. When the peppers begin to break down and soften, add 1 cup water. Let come to a simmer for 5-10 minutes. 9. 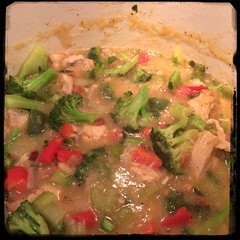 Once the ‘slop’ has been simmering for at least 5-10 minutes, fold in the broccoli, let cook for 10 minutes or so. 10. When the broccoli begins to soften add another cup of potato soup, allow to cook for a final 10 minutes or so. Toss in fresh parsley near the end.